1 “Health disparities: A case for closing the gap.” Office of Health Reform, Department of Health and Human Services, 2009. (Accessed at http://www.healthreform.gov/reports/healthdisparities/). 2 Russell, L. M. (2011). “Reducing disparities in life expectancy: What factors matter?” The Institute of Medicine. (Accessed at http://www.iom.edu/~/media/Files/Activity%20Files/SelectPops/HealthDisparities/2011-FEB-24/Commissioned%20Paper%20by%20Lesley%20Russell.pdf). 3 “Overview of the Uninsured in the United States: A Summary of the 2011 Current Population Survey.” Office of the Assistant Secretary for Planning and Evaluation, U.S. Department of Health and Human Services, 2011. (Accessed at http://aspe.hhs.gov/health/reports/2011/CPSHealthIns2011/ib.shtml). 4 Carmen DeNavas-Walt, Bernadette D. Proctor, and Jessica C. Smith, U.S. Census Bureau, Current Population Reports, P60-239, Income, Poverty, and Health Insurance Coverage in the United States: 2010, U.S. Government Printing Office, Washington, DC, 2011. P. 26. (Accessed at http://www.census.gov/prod/2011pubs/p60-239.pdf). 5 Patient Protection and Affordable Care Act (Public Law 111-148) and Health Care and Education Reconciliation Act of 2010 (Public Law 111-152). 7 Benjamin D. Sommers and Karyn Schwartz, “2.5 million young adults gain health insurance due to the Affordable Care Act.” Office of the Assistant Secretary for Planning and Evaluation, Department of Health and Human Services, 2011. (Accessed at http://aspe.hhs.gov/health/reports/2011/YoungAdultsACA/ib.shtml). The estimate is based on data from the June 2011 National Health Interview Survey (NHIS). 8 “New Report Shows Affordable Care Act Has Expanded Insurance Coverage Among Young Adults of All Races and Ethnicities.” Office of the Assistant Secretary for Planning and Evaluation, Department of Health and Human Services, 2011. (Accessed at http://aspe.hhs.gov/health/reports/2012/YoungAdultsbyGroup/ib.shtml). 9 Estimates provided to the Office of the Assistant Secretary for Planning and Evaluation under contract no. HHSP23320095649WC. Information on the RAND COMPARE model is available at http://www.rand.org/health/projects/compare.html. 10 Section 2001. Section 2002 provides for an income disregard of 5 percent of Federal Poverty Guidelines, raising the effective income limit to 138 percent ($31,809 for a family of four). 12 “Health disparities: A case for closing the gap.” Office of Health Reform, U.S. Department of Health and Human Services, 2009. (Accessed at http://www.healthreform.gov/reports/healthdisparities/). 14 “Elimination of health disparities.” U.S. Department of Health and Human Services, 2012. (Accessed at http://www.healthcare.gov/prevention/nphpphc/strategy/health-disparities.pdf). 15 “Cancer health disparities.” National Cancer Institute, National Institutes of Health, U.S. Department of Health and Human Services, 2008. (Accessed at http://www.cancer.gov/cancertopics/factsheet/disparities/cancer-health-disparities). 16 Section 1001. Information on the preventive services that are covered is available at http://www.healthcare.gov/news/factsheets/2010/07/preventive-services-list.html. Certain plans designated as “grandfathered” are not subject to this provision. 17 Centers for Disease Control and Prevention (CDC), “Colorectal Cancer Rates by Race and Ethnicity,” (Accessed at http://www.cdc.gov/cancer/colorectal/statistics/race.htm, February 2, 2012). 18 CDC Slide Set: HIV Surveillance by Race/ Ethnicity through 2010 (March 2012). 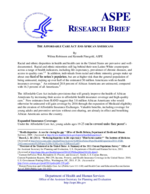 (Accessed at http://www.cdc.gov/hiv/topics/surveillance/resources/slides/race-ethnicity/slides/2010-HIV-RaceEthnicitySlides.pdf). 20 The Medicare preventive services provisions are in Section 4104. Medicare enrollment data computed from 2009 Medicare Current Beneficiary Survey. The complete list of benefits covered with no cost-sharing is available in “The Affordable Care Act: Strengthening Medicare in 2011,” U.S. Department of Health and Human Services (Accessed at http://www.cms.gov/apps/files/MedicareReport2011.pdf). 21 “HHS action plan to reduce racial and ethnic health disparities.” U.S. Department of Health and Human Services, 2011. (Accessed at http://minorityhealth.hhs.gov/npa/files/Plans/HHS/HHS_Plan_complete.pdf). 22 Innovation Center, Health Care Innovation Challenge Funding Opportunity Number: CMS-1C1-12-001, CFDA: 93.610, (Accessed at http://www.innovations.cms.gov/Files/x/Health-Care-Innovation-Challenge-Funding-Opportunity-Announcement.pdf). 23 Mead, H., Cartwright-Smith, L., Jones, K., Ramos, C., Siegel, B., Woods, K. (2008). “Racial and ethnic disparities in U.S. healthcare: A chartbook.” The Commonwealth Fund. (Accessed at http://www.commonwealthfund.org/usr_doc/Mead_racialethnicdisparities_chartbook_1111.pdf). 24 Eighty percent of all patients seen at community health centers reported their race. Of patients reporting their race, 26 percent identified themselves as African American. 25 “The Affordable Care Act helps African Americans.”The White House, 2012. (Accessed at http://www.whitehouse.gov/system/files/docs/the_aca_helps_african_americans_fact_sheet_0.pdf). 26 Relevant sections include 5207, 10503, and 10908. 27 National Health Service Corps numbers from the Department of Health and Human Services, Health Resources and Services Administration, Bureau of Clinician Recruitment and Service, March 30, 2012; physician workforce estimates from Association of American Medical Colleges, Diversity in the Physician Workforce: Facts & Figures 2010 (accessed at http://www.brynmawr.edu/healthpro/documents/AAMC_DiversityPhysicianWorkforce.pdf). 28 For example, Section 5402 provides for loan repayments and educational assistance for health care professionals with disadvantaged backgrounds, and provision of training in cultural competency is a priority criterion for support and development of primary care training programs under Section 5301. 29 Sections 4302, 6301, 10334. 30 More information on the Community Transformation Grant program can be accessed at http://www.cdc.gov/communitytransformation./. 31 More information on the HHS Disparities Action Plan can be accessed at http://minorityhealth.hhs.gov/npa/templates/content.aspx?lvl=1&lvlid=33&ID=285.